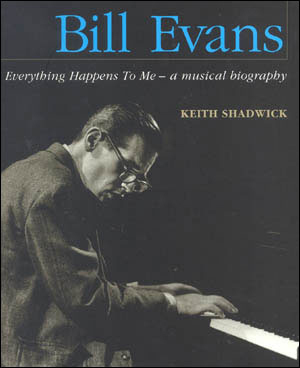 One of the giants of modern jazz piano, Bill Evans emerged on the New York jazz scene in 1956 and by 1958 had joined the Miles Davis Sextet. This brief but brilliant association culminated in the 1959 recording Kind of Blue. Containing two Evans compositions, this landmark album is considered the classic example of modal improvisation and its harmonic extensions. Evans’ emotive approach to jazz was powerful yet elegant, with hushed tones, subtle pedaling, and understated dynamics. This book chronicles his entire performing and recording career. Readers discover his early work, the triumphant trio with Paul Motian and Scott LaFaro that ended tragically, restless experiments that bucked musical trends, and more through his drug-related death in 1980 at age 51. With over 100 color and black-and-white photos.by Keith Shadwick.